Hands On! 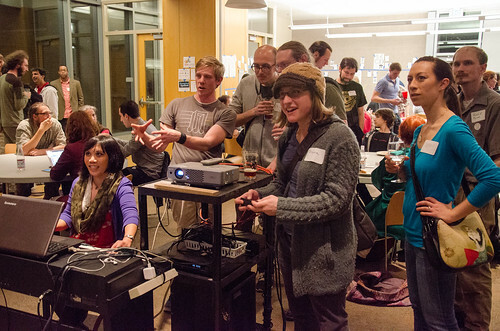 BarCamp Portland 8 will be March 28-29, 2014! BarCamp Portland 7 by @reidab. Look down at your hands (or your robotic light up claw, or your flippers or what have you). Think about all the things you do with them in any given day. Think about how much fun it would be if you indeed, had a robotic light up claw. Your call to action for this year’s BarCamp Portland is: What can you touch? Last year we had the textures of wood and hops and some touch dancing. This year we want to appeal to your tactile senses. Is it fuzzy? Rough? Smooth? Steel? Copper? Melty? Can you eat it with your hands? Can you form it into a shape that wasn’t there before? Or is it made of cloth? Or silly string?Or rare wood found deep under the sea and washed up on the shore? We want you to think about what it is that keeps your hands occupied, and your heart light and how you can share that with the rest of the community! Let us know you’re coming! RSVP now. BarCamp Portland 8 will take place March 28-29, 2014 at the Eliot Center in Portland, Oregon. Please RSVP if you’re planning to attend and consider giving a few bucks to support the event. Help us create BarCamp Portland! BarCamp Portland is a volunteer-run event through and through. This means we need to make it happen. Your ideas, your time, your skills, your passion. As such, we’re having a Volunteer Meetup on Monday, November 4th at Mozila Portland. Please attend if you’d like to help make BarCamp Portland even more awesome! Sponsoring is a great way to support our community and connect with a diverse audience of designers, makers & crafters, web developers and other skilled technologists. More details available at About | Sponsorship or by emailing sponsor@barcampportland.org. Sponsorships are available on a sliding scale, with suggested amounts of $250, $500 or $1000 depending on the size of your business. Funds go towards venue and food costs. Extra funds are put forth for future Stumptown Syndicate events.